Once upon a time – before Amazon and Kindle, before Barnes & Noble or dot-com anything – independent bookstores thrived across America. They were the one place where toddlers, college students, the middle-aged, and elderly could all find something they loved. Many had creaky wooden floors and labyrinthine rooms packed tight with shelves. There might be a dog napping behind the counter. Whatever the décor, bibliophiles arrived. They loved losing themselves in the stacks. They loved the look and feel – the smell – of books. Strangers became familiars, letting each other in on their intimate reading lives. They shared favorite titles. They talked about authors like old friends. In short, people gathered together to swoon over literature and bond over books. For much of the 20th century, independent bookstores were the only game in town. But all that began to change. In 1994, Amazon opened their virtual doors. They sold only books for their first four years. Now, they’ve captured almost half the bookseller’s market (today, books account for less than 10 percent of Amazon’s total sales). Then they introduced the Kindle in 2007. Soon after, competitors began producing their own e-books. E-readers represent 55 percent of online book purchases. Audio books are a small but growing faction. Customers became consumers. Algorithms began replacing personal recommendations. And the big box stores – Barnes & Noble and Borders – started to drive what was left of independent bookstores out of business. Between 1995 and 2000, American Booksellers Association (ABA) reported that the number of independent bookstores in the United States plummeted 43 percent. Then another funny thing began to happen. Like a phoenix rising from the ashes, within the past 10 years, independent bookstores began to flourish. According to the ABA, the number of independent U.S. bookstores increased 35 percent from 2009 to 2015. Today the figures look even better. In 2018, there were 1,835 independent bookselling companies running 2,470 stores. They became a natural gathering place for locals and tourists alike – book clubs and author events, book signings and readings, children’s story hours and political roundtables. Turns out, people craved the personal interactions and customized recommendations they were missing online and they turned to books, booksellers, and other book lovers to find it again. But let’s go back. Back to 2004, in the midst of all this retail chaos and e-reader frenzy. Back to when attention spans started to flounder and the appetite for literature began to wane. Laguna Beach’s Fahrenheit 451 had been closed for a decade. Latitude 33 bifurcated its business with a photography store. The old Pottery Shack came up for sale. Jane Hanauer and her husband, Joe, saw opportunity. 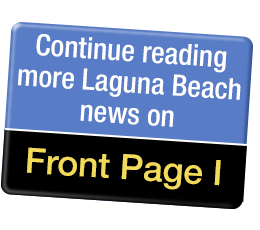 When the recession hit a year later – along with the Kindle and Amazon’s discounted competition – Laguna Beach Books struggled, but they still weathered the financial storm. So what accounts for its continued success through difficult times and in a difficult marketplace? As author John Green observes, “You cannot invent an algorithm that is as good at recommending books as a good bookseller.” This sets stores like Laguna Beach Books apart. An artful seller not only knows their products, they listen to their clients. For readers interested in this phenomenon, Weaver (unsurprisingly) has a few book recommendations for you – Weapons of Math Destruction by Cathy O’Neil and The Efficiency Paradox by Edward Tenner. Two years ago, local high school student Haley Rovner joined part time. “Haley and I are the only ones who read young adult (YA), science fiction, and fantasy,” says Weaver. “Having Haley on staff helps immensely because she’s widely read in YA. That’s the niche we’re trying to nurture – our upcoming readers.” The death of the reader continues to be one of the biggest issues bookstores face. While tourists are important to business, Laguna Beach Books lives for local clientele. It also supports local authors. Some of Laguna’s notables include James Utt (Laguna Tales & Boomer Wails: A Memoir), Kaira Rouda (Best Day Ever, the forthcoming The Favorite Daughter, and several others), and Suzanne Redfearn (Hush Little Baby, No Ordinary Life, and the forthcoming In An Instant). “If books reflect the area in which the books are being sold, they sell better,” says Hanauer. The store also hosts monthly book clubs. They foster political discussions (recently holding an event for local and newly elected congressman Harley Rouda). And they organize frequent author events and books signings, both by local writers and nationally recognized bestsellers. Recent guests include Lisa See, T. Jefferson Parker, Elizabeth George, John Hart, Ruth Reichl, and Martha Hall Kelly, to name just a very few. Upcoming events will feature Megan Griswold and Dani Shapiro. And, because books are the great equalizer in any society, Laguna Beach Books is also the perfect place for some star sightings. Justice Sandra Day O’Connor, former FBI Director James Comey, actors Pierce Brosnan, Rob Lowe, Robert Englund, Rita Rudner, Melanie Griffith, Alan Rickman, and Benicio del Toro have all visited the store. Author Mitch Albom is also a regular. Comey even got a little choked up after reading the blurb Sheila Morshead wrote about his book A Higher Loyalty. Ryan Raffaelli, an assistant professor in the Organizational Behavior unit at Harvard Business School, made a long study of the independent bookstore phenomena in 2017 as part of his “technology reemergence” research. He concluded that three factors (coined the “3 Cs”) accounted for the resurgence of the independent bookstore: community, curation, and convening. Spending time in the store, and talking to the staff, it’s easy to understand its success. Together, the many tales of Laguna Beach Books tell one of the most enduring love stories ever written – people’s love of books. For more information, staff picks, LBB bestsellers, author events, and more, visit www.lagunabeachbooks.com or call (949) 497-4779. LBB is located at 1200 S Coast Hwy.